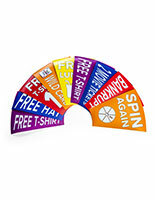 12 blank prize slots can convert to 24 by printing new inserts. Detachable leg extensions change from floor to tabletop in minutes. 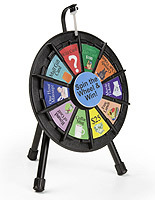 Plastic clicker creates an exciting noise when game wheels are spun. 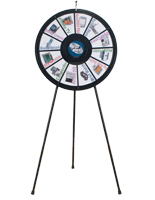 These raffle wheels are great promotional tools for rewarding participants during a trade show, merchandise sale, fundraiser or office gathering. 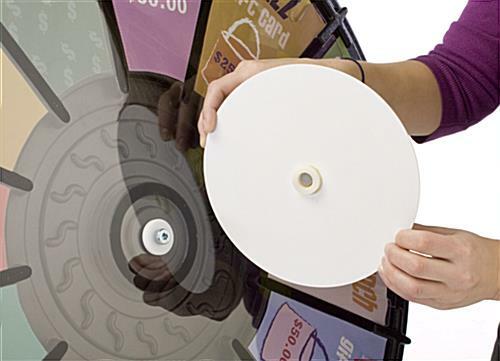 The spinning carnival displays feature 12 blank sections, giving users freedom to create personalized incentives and awards. These game wheels are also equipped with double the amount of notches, so users can easily switch a 12-slot display to 24 section gaming system! These gaming accessories include a customizable, sign holder in the center. 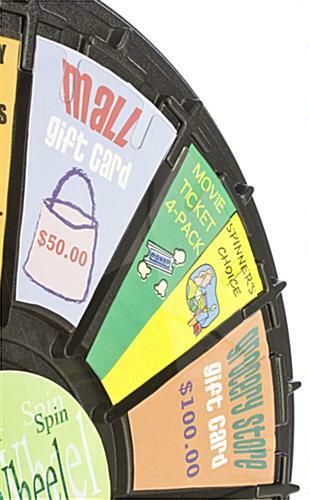 Game wheels, also known as prize wheels, utilize a plastic clicker to create a well-defined clicking sound, building anticipation within players. 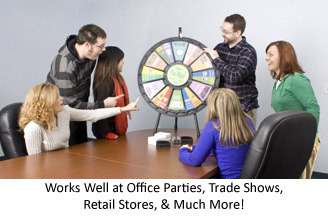 The unique noise will also draw in more visitors to a tradeshow booth or store! 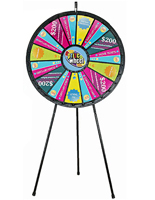 Raffle wheels are constructed from ABS and PETG plastic. Gaming displays use a steel tripod to keep a presentation upright and in position. 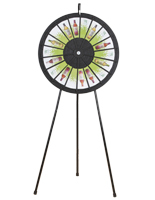 These game wheels are even adjustable, converting to tabletop fixtures without much effort. 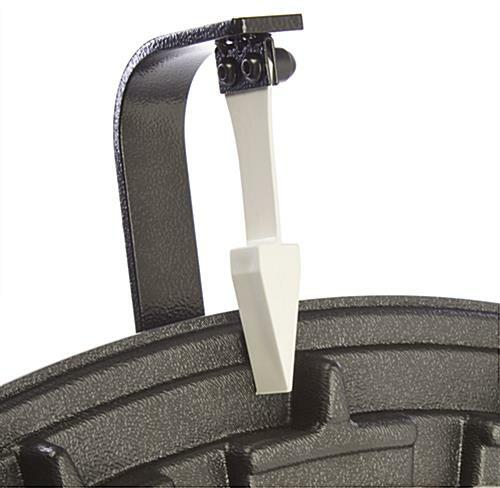 Simply detach the extenders from the stand and slide the rubber feet onto the shorter legs. 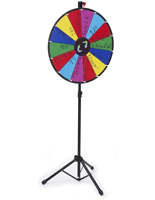 These game wheels work for corporate event planners or exhibitors, as the wheels only weigh 12 pounds! This makes the amusement display incredibly easy to transport. 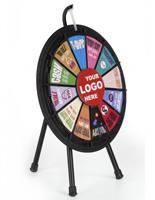 These prize wheel fixtures add an element of fun to any marketing campaign! Please note: This unit is compatible with our PWCASE31 carrying case. 31.0" x 9.0" x 34.0"
The item is what I was looking for, but it did come a bit scratched which was unfortunate. It's just what we were looking for and we need it for an event so we will use it, but it was a bit disappointing. What an awesome review, Josh! 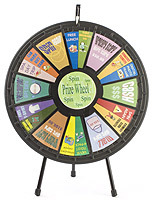 Feel free to share a photo of your prize wheel on our Facebook wall! We love it when our customers show off their products "in action"! 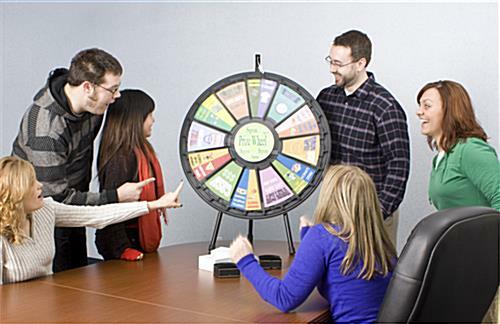 This is the 2nd large wheel we've purchased. It's a big hit at events. We like the option to use as a tabletop or floorstanding. 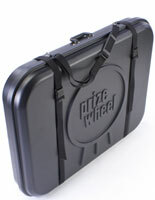 The carrying case we purchased is extra handy to transport this wheel. Thank you for taking the time to write this review, Diana! Feel free to like us on Facebook and share your photo on our wall, too! We also offer various discounts on social media that you may be interested in for future purchases. 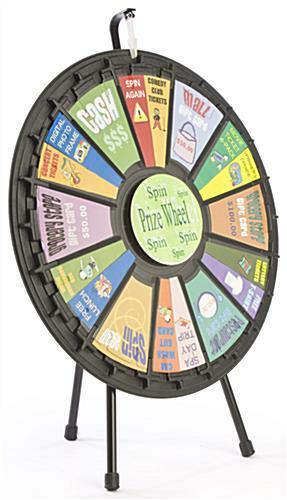 This wheel is designed and functions well. The quality of build is exceptional and should last a long time. I rate this at 4/5 stars because the templates available online are difficult to modify without Adobe software. Hi Tyson, Thank you for your feedback.